Maximum power from a 12" (30 cm) chipper. The BC1000XL combines an impressive 85 HP (63 kw) engine, a large 12" x 17" (30 cm x 43 cm) feed opening, a clutchless PTO and a rubber-torsion suspension for maximum performance in the field. 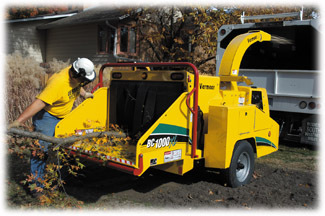 The BC1000XL also offers a noise-reducing design and has an optional sound-abatement package available that makes it one of the quietest and most productive chippers in the field.